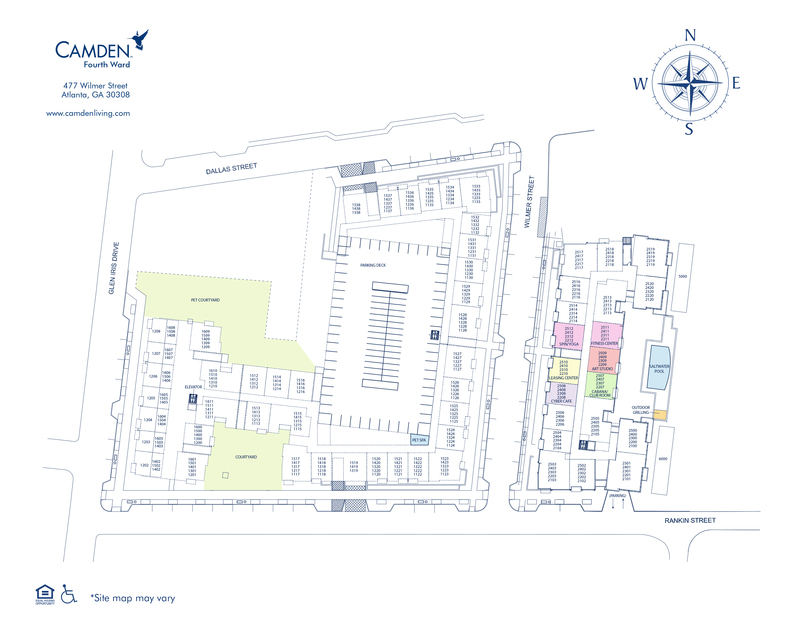 Camden Fourth Ward is more than just an address, it’s Atlanta’s premier apartment community featuring one and two bedroom floorplans for rent. Our attention to detail and dedication to upscale living is evident in our three custom designed interior finish packages. With full-size washer and dryer, 9-foot kitchen islands, and amazing views of Historic Fourth Ward Park and Ponce City Market our one and two bedroom apartments were designed with you in mind. Our community is perfect for entertaining with friends or enjoying a quiet night in. Camden Fourth Ward is the best place to relax at our saltwater pool and lounge under the cabanas while grilling a burger in our outdoor grilling area. Our fully equipped fitness center with free weights, cardio equipment, spin, and yoga studio is just what you need to stay fit. Do you love being creative? Our art studio can be used to splash paint on a canvas or sculpt something beautiful with your hands. Our non-smoking community is located directly on the 17-acre Historic Fourth Ward Park. Enjoy walking out the gate from our 2nd-floor pool into the one and only Atlanta Beltline, an interactive splash park, skate park and a 2-acre pond. Plus, we are walking distance to Ponce City Market and an abundance of one-of-a-kind restaurants, and shops. This location is ideal for runners, bike enthusiasts, and pet owners! We are also conveniently located next to Whole Foods, Publix, Kroger and Trader Joe’s for your everyday needs. Commuting is a breeze with close access to I-78, I-85, and I-285. Don’t have a car? No worries! We have bike racks on every level of the parking garage and an onsite bike fix-it station with and air pump to make sure your bike is in working order. All of our homes include high-speed internet and digital cable in your total monthly rent. Come home to Camden Fourth Ward, where you will #LiveWithVibrance! Call today to make an appointment and see for yourself. Get the perfect spot! We have ample open parking for our residents in the parking Garage. Visitors may park on the street on a first-come, first-served basis.